March was a landmark and milestone month for the Zone Show. 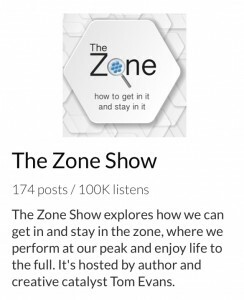 Not only did the audiobook of the Zone have an amazing month of sales – and some great feedback – but the podcast reached over 100,000 listens! As usual too, it was a great month for guests too with a pretty amazing and eclectic bunch of conversations. Topics ranged from connecting to angels, how to deal with suicide, how do de-stress, how to become smart about gender and how to declutter your house with feng shui. There may of course be a connection between the five themes – who knows? I also notice that I haven’t yet had a male guest on the show all year and have none booked for April or May – come on guys, share your wisdom!